« Amazing Seeds for Minecraft – Fresh Update now with Xbox 360 Seeds! 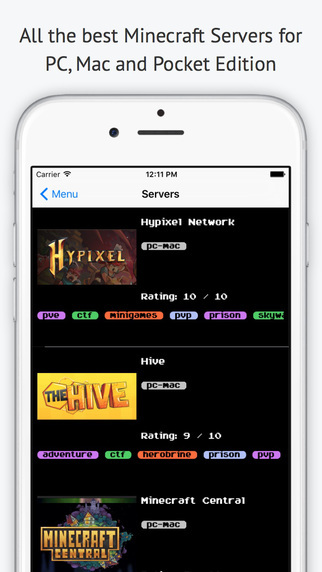 After months of development, I’m happy to announce my latest app – Amazing Servers for Minecraft – is now available on the App Store! Amazing Servers for Minecraft follows in the footsteps of Amazing Seeds for Minecraft. It is an app that contains all the greatest Minecraft servers for both Pocket Edition and the desktop PC/Mac Editions of Minecraft. I’ve carefully reviewed and tested each Minecraft Server before I include it in the app so only the best makes it in. Part of my testing is to make sure the games on each server are fun, work well and that the server is not laggy or crash prone. Download Amazing Servers for Minecraft and check it out today! Like almost all of my apps, it is free!